Collier Fermain, sunk today by the Luftwaffe in the English Channel. Italian/Greek Campaign: The British Operation Lustre has brought over large British Army troop concentrations by 2 April 1941, and more are arriving daily. Major General Sir Bernard Freyberg positions his New Zealand Division on the Aliakmon Line, which follows the river Aliakmon from the Aegean coast around Katerini westwards on the river's south bank. This is as far forward as the British feel may be defensible, but the Greeks prefer a line along the border with Bulgaria. East African Campaign: The Italians at Massawa know that, with The Indian 5th Infantry Division moving quickly from Asmara toward Massawa, time is short. They send five destroyers (Battisti, Manin, Pantera, Sauro and Tigre) on a one-way mission to attack Port Sudan and then scuttle themselves. The Royal Navy and RAF both have strong forces in the area, so the Italian destroyers face a daunting task in carrying out their mission. Around this date, British Major General Lewis Heath, commander of the Indian 5th Infantry Division, gets on the telephone and calls Massawa. Italian commander Rear Admiral Mario Bonetti gets on the line and refuses an ultimatum to surrender. Heath also demands that Bonetti not block the harbor with sunken ships, else the British would not protect Italians from natives after the Italian troops are disarmed (which has become a problem recently for the Italians remaining behind in cities to be occupied by the British). Bonetti also refuses this obvious attempt at extortion. The RAF bombs and sinks two Italian freighters near Dalac Island off Abyssinia: 7669 ton Giuseppe Mazzini and 7099 ton Urania. The British later will salvage these for their use. 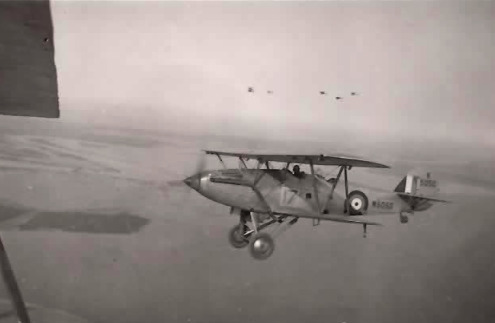 A Gordon bomber over Iraq operating out of RAF Habbaniya, April 1941. European Air Operations: The RAF continues attacking Axis shipping off the Dutch coast. In addition, the RAF flies Circus and Rhubarb missions over occupied France. The British are aware that the Luftwaffe is sending units east and wants to take advantage of their absence and perhaps force the Germans to bring some back. While undoubtedly a propaganda coup, the tea-raid presents a couple of odd contradictions. One, the British love tea, but Lord Woolton has had to ration it due to its short supply - making a showy expenditure of so much fine tea a slap in the face of British tea drinkers. Second, the British have been adamantly opposed to any US humanitarian aid to Occupied Europe - and then they drop perfectly usable tea on it. A Hawker Hurricane from RAF No. 504 Squadron shoots down a He 111 P-2 from 7./KG 55. The P-2 version of the He 111 medium bomber is specially armored and has various other improvements such as extra defensive armament and extra bomb capacity. The Detroit Free Press, 2 April 1941. 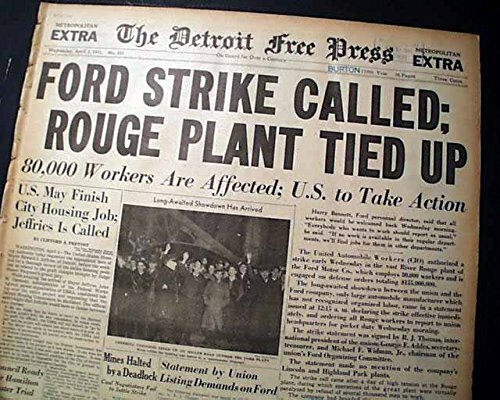 The Ford Motor Company refuses to recognize the United Automobile Workers union, and Ford head of security Harry Bennett has fired eight union workers, causing a walkout. Battle of the Atlantic: U-boat Command has set up a picket line of 8 U-boats about 500 miles southwest of Iceland and southeast of Greenland. Among the U-boats are U-46 and U-48. As planned, an Allied convoy, in this case SC-26, appears, and the U-boats go to work. U-46 (Kptlt. Engelbert Endrass) torpedoes and sinks 7000 ton British tanker British Reliance southeast of Greenland. Everybody survives. Operating in roughly the same region as U-46, U-48 (Kptlt. 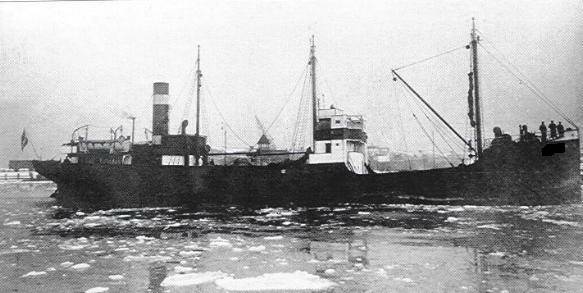 Herbert Schultze) torpedoes and sinks 9957 ton British refrigerated cargo ship Beaverdale. There are 21 deaths. Royal Navy submarine HMS Tigris (Lt. Cdr. H.F. Bone) attacks and sinks 5486 ton German armed tanker Thorn about 75 miles (110 km) southwest of St. Nazaire in the Bay of Biscay. The attack is distinguished by the huge amount of effort that Bone puts into the attack: no less than seven torpedoes and gunfire. Tankers are always difficult to sink because of their construction, but that is an inordinate amount of munitions for one medium-sized ship. The Luftwaffe attacks shipping off St. Abb's Head in Berwickshire, Scotland. The planes sink two Royal Navy minesweeping trawlers, 180 ton HMT Cramond Island and 259 ton HMT Fortuna. Everybody on board the Fortuna, 15 men, perishes, while two perish and three are wounded on the Cramond Island. The Luftwaffe bombs and sinks 759 ton British collier Fermain in the English Channel off Boulogne. Everyone survives. The Luftwaffe bombs and damages 873 ton British tanker Wild Rose about 12 miles (20 km) southeast of Tuskar Light House, County Wexford, Ireland. Towed to Rosslare Harbour and beached, the tanker is later refloated and taken to Dublin for repairs. British 1908 ton freighter Melrose Abbey hits a mine and sinks north of Aberdeen in the River Ythan. It is later refloated and taken to Aberdeen for repairs. British coaster Coombe Dingle runs aground at Carnalea, County Down and is written off. Greek freighter Nestos runs aground in Liverpool Bay and is written off. German battleship Bismarck is still receiving items for its planned sortie into the Atlantic. Today, it is supplied with two of the four Arado Ar 196 floatplanes that are to be housed in a hangar behind its main superstructure. Royal Navy minelayer HMS Plover lays minefield ZME 27 in the Irish Sea. It is to lay multiple minefields in the ZME series over the next three weeks. Convoy OB 305 departs from Liverpool. Royal Navy submarine HMS Uproar (P 31, Lt. John Kershaw) is commissioned. 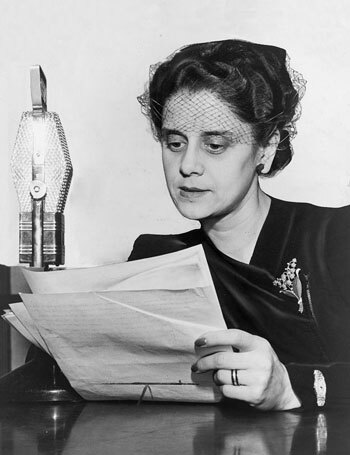 WQXR News Commentator Lisa Sergio, April 2, 1941. WQXR broadcasts in FM, and Lisa Sergio is a pioneer female radio news commentator (NYWT&S Collection, Library of Congress). Battle of the Mediterranean: The Afrika Korps maintains its momentum. When the Germans spot the British heading east around noontime, Lieutenant General Rommel at 13:00 orders the 5th Light Division panzers take Agedabia (Ajdabiya). Rommel also sends one column apiece toward Derna and Tobruk. Tellingly, Rommel only issues these orders verbally, knowing that they are contrary to standing orders not to attack. After putting up a defense in the morning, the British 2nd Armoured Division withdraw under orders to Antelat about 35 miles (56 km) to the northeast. This leaves Benghazi open to attack. From messages I have received I take it that your advance continues. This is contrary to what I have ordered. I politely request that you wait for me before you continue the advance. This rather perfectly encapsulate the state of Italian generalship during World War II. At sea, Operation Winch begins. This is a resupply of Malta, including a flight of a dozen Hurricanes to be flown off HMS Ark Royal. The Ark Royal is accompanied by battlecruiser Renown and light cruiser Sheffield. The Luftwaffe attacks Convoy AS 23 in the Aegean off Gavdo Island. The German planes sink 4914 ton Greek freighter Coulouras Xenos and and badly damage 5324 ton British freighter Homefield. The Royal Navy escorts later need to sink the Homefield. Greek 2747 ton freighter also is damaged by near misses, but makes it to port in Crete. The German planes also damage 6054 ton British freighter Devis of Convoy ANF 24 in the same area. Two Yugoslavian freighters hit mines and sink off Croatian city Šibenik: 1293 ton freighter Karadjordje and 1726 ton freighter Prestolonaslednik Petar (Star). Everybody on both ships survives. A convoy of five freighters departs from Naples bound for Tripoli. A 1941 Chrysler Royal 4-Door Sedan. 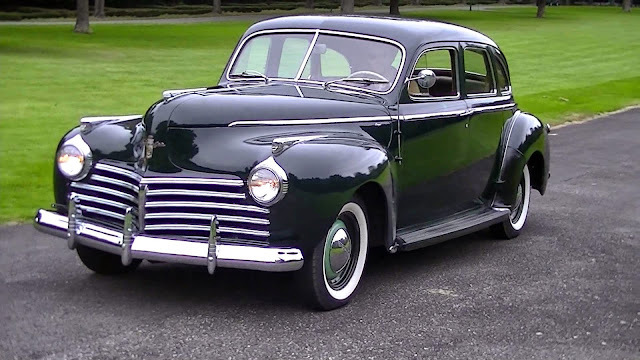 This one survives in Indonesia. Indian/German Relations: Subhash Chandra Bose, having fled British custody in India, finally reaches Berlin after a circuitous route. The Pope took an utterly detached attitude, free of any favoritism regarding the European war, and approached the question from the point of view of a general peace throughout the world. Propaganda: Lord Haw-Haw, the German radio propagandist who speaks in curiously cultured tones, identifies himself as William Joyce. 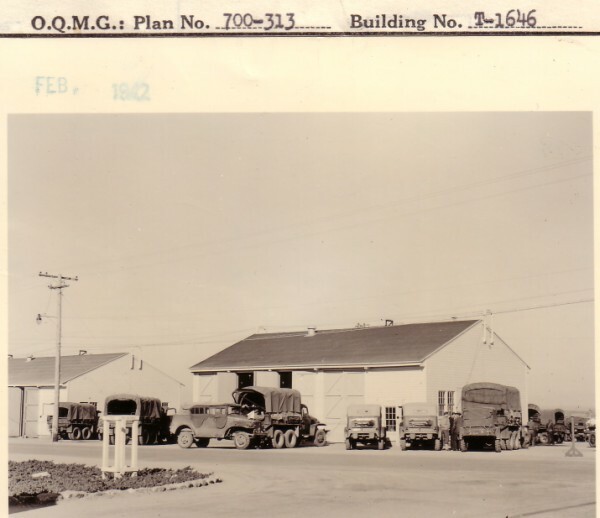 The Shop Motor Repair building at Fort Ord, California, completed 2 April 1941 (Fort Ord Buildings, Completion Report Pictures. US Military: Cruiser USS Astoria departs Hawaii for Long Beach, California. It is to be upgraded with quadruple-mount 1.1 in (28 mm)/75 cal anti-aircraft guns and preparations for air-search radar. German Military: Some sources place the first flight of the Heinkel He 280 jet fighter under its own power today. However, other sources place it on 30 March, where we have put it. Hungarian Government: Prime Minister Pal Count Teleki de Szek learns that Chief of the General Staff General Werth secretly has agreed to allow Wehrmacht troops into Hungary. Teleki denounces Werth as a traitor and then commits suicide because of his abhorrence of working with Hitler. The new Prime Minister is Foreign Minister Laszlo Bardossy, known to be extremely sympathetic to Germany. Yugoslavia: The German government basically closes its embassy in Belgrade, reducing it to a skeleton staff and destroying all documents. Its counsellor, Gerhard Feine, reports that the Yugoslavs are having second thoughts about opposing Germany and even about the coup itself. Feine is told to warn members of friendly embassies to seek safety elsewhere. The Yugoslavian military attaché reports to Prime Minister Simovic that the Germans are to invade on the 6th. Simovic continues to refuse to contemplate military coordination with Great Britain. Iraq: Rashid Ali consolidates power in Baghdad after his successful coup. British ambassador Sir. Kinahan Cornwallis arrives to a situation vastly changed from when he set out from London. China: The Japanese 11th Army continues its gradual withdrawal to its bases after the Battle of Shanggkao. The Chinese continue to pressure the Japanese and recover Hsishan, Wanshoukung, and Shihchachieh. 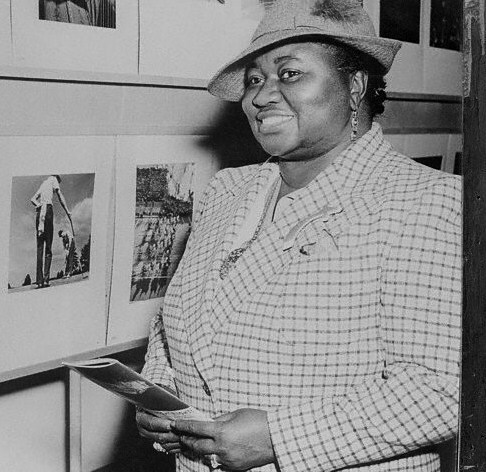 Hattie McDaniel (Mrs. Donald Crawford) caught by photographers at the exhibit of the Press Photographers Exhibit at the Museum of Science and Industry in New York City. 2 April 1941 (© Bettmann/CORBIS). American Homefront: Harlan County, Kentucky has been the scene of violent Union confrontations throughout the past decade. Today, it explodes into violence once again. On 1 April, miners went on strike due to expiration of a Union contract. Union pickets (United Mine Workers Association) enter the Crummies Creek Company Store at 10:00 today and attempt to purchase a Coca-Cola using cash. The store's manager refuses, citing company policy that only company script is accepted there. There are few other places in mining towns to buy supplies, which is a key element of company control. The Union men refuse to leave without their soft drink, and an altercation ensues (with the particulars disputed by both sides). The store has a machine gun hidden under a butcher's apron, mounted on a meat block, and an employee runs to it and opens fire. There are four dead and four seriously wounded Union workers, along with a wounded African American bystander and a lightly wounded company worker. The Union charges that the company men opened fire "from the bushes." The Company, meanwhile states that the shooting occurred only after the Union men roughed up the store manager and tried to force him to sign Union "check-off" slips. He also alleges that the striking Union men had .45 pistols and "started trouble." There also are reports of various other assaults on journalists and company men. Future History: Barret Eugene Hansen is born in Minneapolis, Minnesota. Barry, as he becomes known, hangs out with rock band Spirit after earning his master's degree in the '60s, then catches on as an A&R man for Specialty Records. This leads to a radio show for Specialty, which leads to a job with Warner Bros. Records. Barry also writes extensively on the rock scene and does liner notes and other rock-associated tasks. His real love is radio, however, and he develops an on-air persona known as Dr. Demento who plays novelty records. The Dr. Demento Show becomes wildly popular playing offbeat tunes by artists such as Judy Tenuta, Emo Philips. Barnes & Barnes and "Weird Al" Yankovic. Dr. Demento remains on the radio and was inducted into the National Radio Hall of Fame in November 2009 and the Comedy Hall of Fame in June 2005. 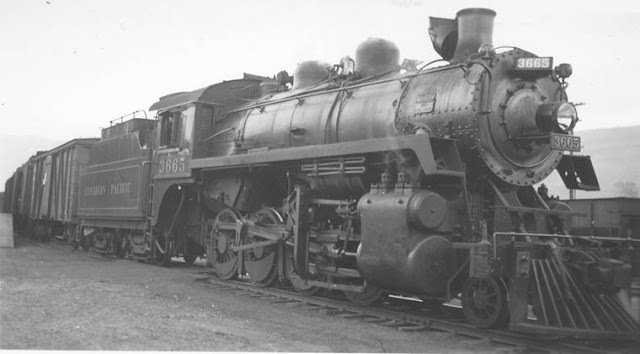 Canadian Railways train 3665, oil-fired with wood pilot and stack exhaust deflector. Salmon Arm, April 2, 1941 (Bud Laws Collection).